Item 1: According to a report filed by Mashable Social Media on July 12, 2012, Facebook has been monitoring user chat activity for criminal intent, and then passing on that information to the Police. To learn more, click here. 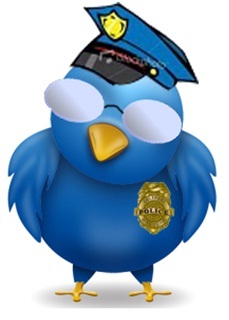 Item 2: On July 2, 2012, Reuters reported U.S. Police were making the most requests for Twitter information. To learn more, click here. Item 3: Despite a Judge's ruling on July 2, 2012, that Twitter must surrender the tweets of Occupy Wall Street protester Malcolm Harris, on July 20th the Wall Street Journal reported Twitter planned to appeal. To learn more, click here. Comment: In an effort to define user and law enforcement rights in this somewhat murky world of new technology, both Facebook and Twitter have set up information sites. However, as suggested by the circumstances of Item 3 above, it is probably going to be some time before the relationship between law enforcement and social media is going to be clearly established.